Celebrate all moms with your hand crafted 14 Karat White Gold and Diamond "mommy" Necklace. In 2009 I learned I having Nixon. I was truly one of the most magical moments of my life. I was 38 and having my first child! The same year, the exact same time, I learned my mother was dying. Nixon's due date was projected to be February 7, 2010...my Mother's birthday. 2010 would prove to be a year to never forget. Nixon was born...my Mother passed away. I love them both unconditionally and eternally. 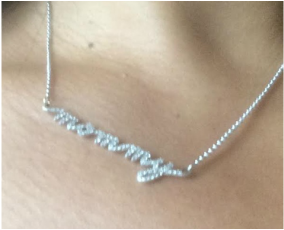 I decided to commemorate the wonder and beauty of my journey by creating my own "mommy" necklace. It stands for everything associated with the honor of being a mother. It stands for the process of gaining and loosing everything simultaneously. It stands for EVERYONE who loves a child and changes the world with her love. It stands for everything I hold precious. Love. Life . Laughter. Motherhood gives my each of these every day. I chose lower case letters to symbolize humility. I chose cursive script to symbolize the connection and every evolving journey. I chose diamonds and gold to symbolize a solid foundation, ever lasting love, and of course, to symbolize that becoming a mother makes you even more fabulous than ever! It comes with it's own number as part of my collection, your own personalized certificate of authenticity and a personalized mommy certificate from me! The necklace is also available in silver and crystal. Pick your necklace style and fill out the pre-order form.